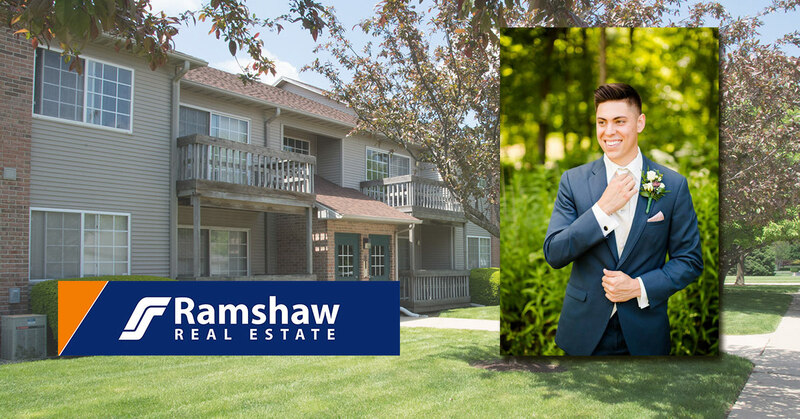 Jordan Dunahee, Leasing Agent, has been with Ramshaw Real Estate a little over a year. As a newlywed, new homeowner, and newly licensed Realtor, Jordan was kind enough to spare a few, rare free moments to give us a little more insight into his life outside the company. Thank you for your excellent customer service, attention to detail and follow up. We can’t wait to see what the future holds for you; with your passion and knowledge of the real estate industry, we know it will be one of success! Before working at Ramshaw Real Estate, what was the most unusual or interesting job you’ve ever had? The most interesting job that I have had before working at Ramshaw was working for the Men’s Basketball team at U of I. It was an awesome experience and I was able to meet some great people and do things I may never have had the chance to do. What is your favorite part about working for Ramshaw Real Estate? My favorite thing about working for Ramshaw is the family-like environment. Everyone here looks out for one another and works together to make our company the best that it can be. I have developed close and lasting relationships and they have helped me put a great foot forward in my professional career! To me, success is a process as opposed to an end-all. Everyone will achieve or experience things on a different level or with a unique reference point. However, I believe if you work day-in and day-out on leading a meaningful life that positively impacts those around you, that’s really all the success you can ask for. If you could meet anyone in the world dead or alive who would it be and why? Michael Jordan. He was my childhood hero and I’ve always been inspired by his relentless pursuit of greatness. I would like to see Chris Pratt cast as me. I love what Chris is all about and I think his personality and demeanor on and off the screen are admirable. Sushi is one of my all-time favorite foods and it has great variety so I don’t think I’d ever get too sick of it! I don’t an exact motto or personal mantra, but I try to always put others before myself because I think that is what life is all about! Being baptized at my home church at age 10; Graduating from U of I in 2017; Marrying my wife, Lauren, almost a year ago now and starting our lives together! What TV show or movie are you ashamed to admit you love? I wouldn’t say that I am ashamed per se, but people seem to think it’s odd that my wife and I love watching Jersey Shore. We were very into the original series and now are watching the reunion episodes. We even went to see DJ Pauly D when he came to Champaign and it was a blast! In 5 years I see myself developing my professional career in commercial real estate and hopefully working on additional business ventures such as income properties. I see my wife and I starting our family and maybe having a kiddo or two running around as well!